Tender chicken breast in a sweet and sour sauce with tangy pineapple and green and red peppers. 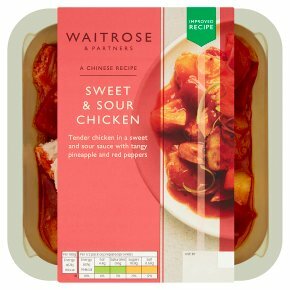 Tender chicken in a sweet & sour sauce with tangy pineapple and red peppers. INGREDIENTS: Sliced chicken breast (31%), pineapple, red pepper, water, rice vinegar, sugar, ginger purée, rapeseed oil, garlic purée, cornflour, tomato purée, rice wine, concentrated pineapple juice, fermented soya bean, salt, spirit vinegar, fermented rice, colour paprika extract, wheat, cane molasses, onion purée, tamarind paste, cinnamon, cayenne pepper, ground clove.